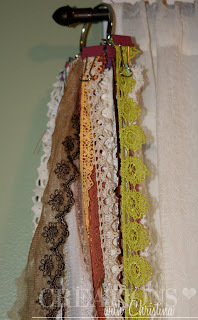 Now I use those awesome 3M removable hooks (I love love love 3M hooks). 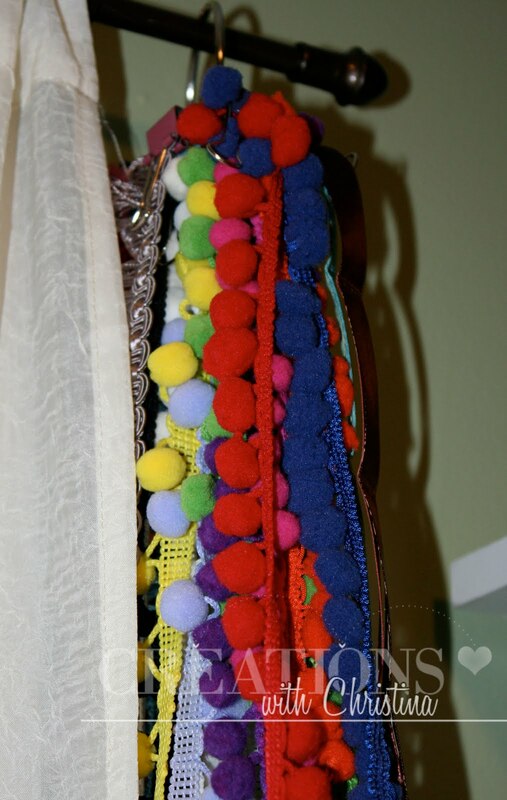 I have 4 hooks on my door with most of my ribbon sorted by color. each color is on one of these large 2" binder rings (Staples). The ribbon is clipped with a binder clip and the tagged with the color and company name...I like to tag my Paper Trey Ink ribbon. of course you have to have one on the other side of the window to keep the rod balanced. This is my fun trim.. This is a great idea! My ribbon is totally out of control. TFA! It's so nice to have things organized so they can be easy to see. Some things get forgotten when they are buried in a pile! So I bought it and have it filled half way so far and I STILL have ribbon from that $3 box!! I have not even gotten to the ribbon I have purchased myself! and plan to post an updated pic to show it half full soon!! What happened to your new comment feature? with the reply capability? 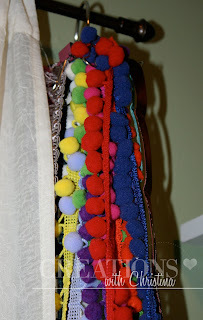 Anywhoo...for those that don't need a ribbon purse that Big...OVerstock also has the original 10" size for sale as well! The Jumbo size is 10" by 17" inches I believe...it is HUGE!! Great idea...have to put this in my favorites for my organizing files. 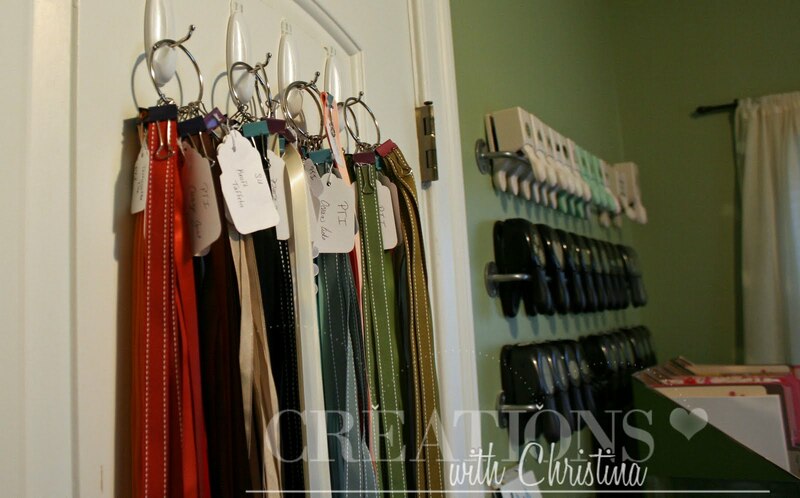 We've been working on my craft/sewing room and I'm always looking for ways to organize it. Thanks again Christina. I also use the binder clips for ribbon that doesn't fit on a spool. My husband drilled holes for dowels under one of my shelves. Then added a l 1/2 inch wooden strip of wood under the dowels with nails 1 inch apart where I hang extra pieces of ribbon on mini binder clips. I agree ribbon is the hardest to store. Oh, I like this! 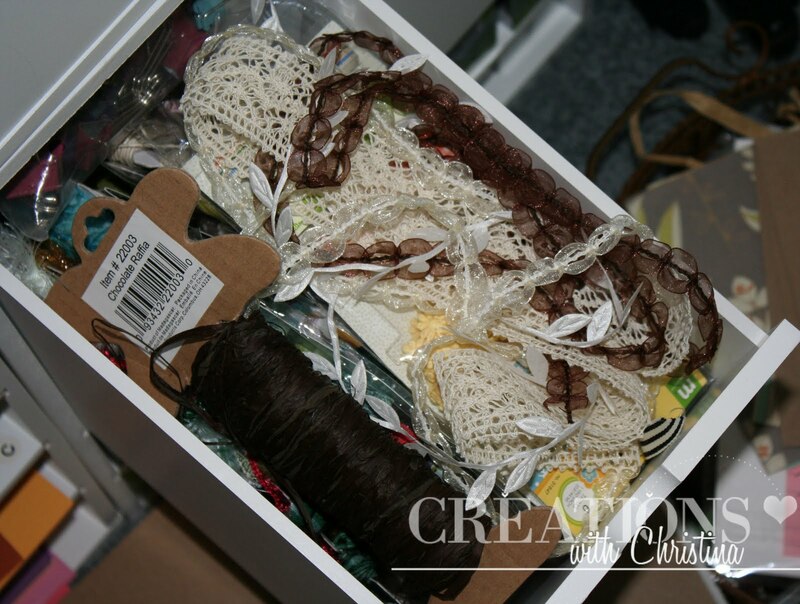 All my ribbon is jammed into a drawer...some on clothespins (like you), some left on the rolls and some just loose and getting crumpled. Thanks! I wish I knew what to do with those little 4-12" pieces that are just too good to toss. I know I'll use them on a card eventually, but I end up working around it all on my craft mat. I have two of those racks from Michaels on my table and love them, plus clothes pins. I'm fairly new so ribbon isn't a problem so far. Thank you for the binder clip idea though. I'm going to remember that. oooh! I love your lace selection! 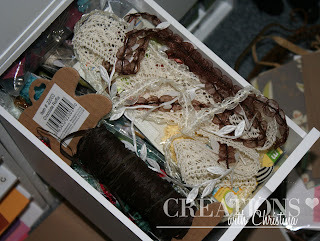 This is very similar to how I store my ribbon, which you can see here: http://kraftieguru.blogspot.com/2010/07/random-leftovers-clean-up-time.html. Pictures toward the bottom. My ribbon is half in storage rolls, half in a box sort of like the one in your picture. I have a large craft room, which means more room for stuff to get spread out everywhere!